Posted on May 25th, 2018. Halkidiki or Chalkidiki is a peninsula in Northern Mainland Greece. The peninsula is said to resemble a hand with three fingers or legs, as the Greeks call them. This unusual shape creates an expanse of coastline covering almost 350 miles. 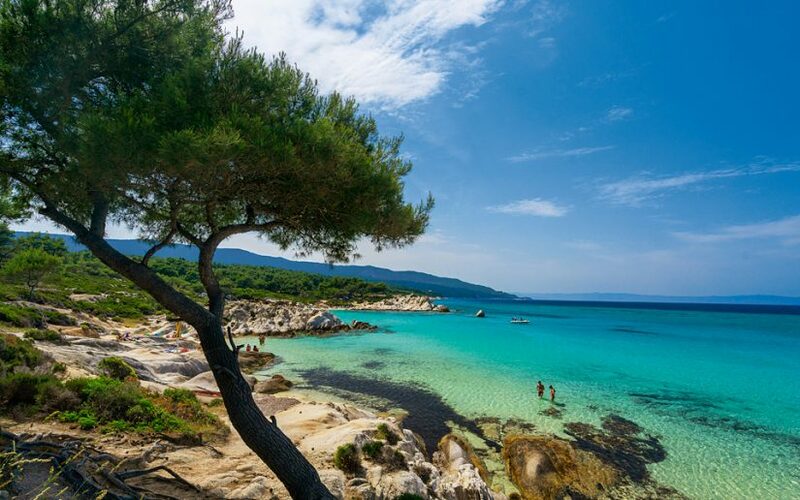 With excellent beaches, wild forested regions and numerous well-spaced villages and towns, Halkidiki is a rich and beautiful land to explore with some of the nicest villas in Greece. Or to paraphrase one of the ancient sons of this great land, Aristotle, ‘the whole is more than the sum of its parts”. Welcome to a crossroads in time, where the ancient world intersects seamlessly with modernity. 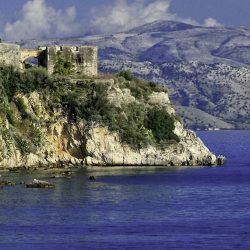 Let’s start our exploration of this unique corner of Greece, lying peacefully along the shores of the Aegean Sea and review some of the experiences that Halkidiki tourism has to offer. Before I travel to a new destination my favourite game is to try to name at least 5 things of interest that I might already know before I embark. As someone who is a magpie for random information, I can usually pull together some facts from the jumble of my brain. Yet on the subject of Halkidiki, I was stumped. Nothing. I had a vague idea of its location in Greece yet when I opened my well-thumbed Atlas I was well off target. It was rather wonderful to discover that all of my pre-trip research of this region would be new information. Looking up “what to see in Halkidiki” was like rubbing a magic lantern and sitting back and waiting for the illumination of knowledge to pour forth. If, like me, this miraculous part of the world has escaped your compass of interest, sit back and be amazed at what I can reveal. Before we launch ourselves completely into tourist attractions in Halkidiki, Greece, I must mention the city that will most likely have been your gateway to the wonders of this peninsula. It is fairly inevitable that you will have landed at Thessaloniki Airport. 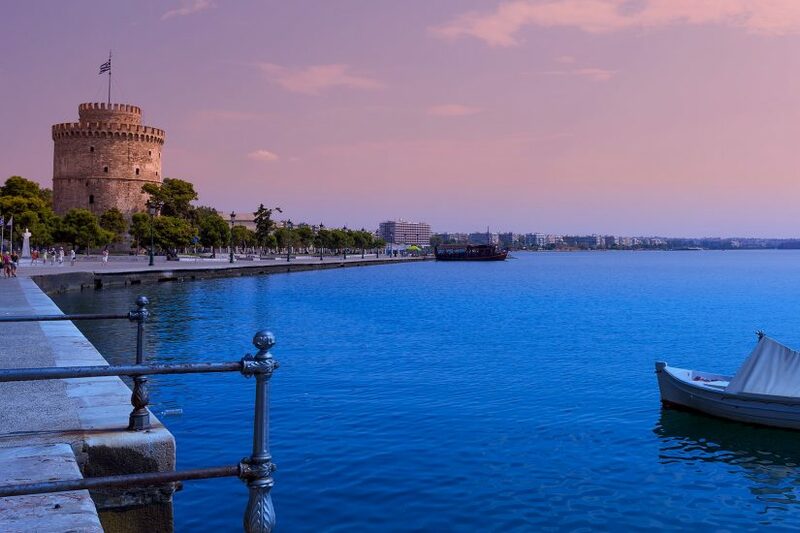 This city, second only in Greece to Athens, is a vibrant, European, bustling destination. Its position in Europe has seen it fall under the control of many different factions over the centuries. It has churches and mosques – a religious representation of the influence of the other Balkan states that have been linked to its history but with a modern attitude that makes it a really fascinating city to explore. With a large population in the region of 300,000, the city has such diverse architecture – where old meets new – with unique cuisine that still contain the spiced influences from Constantinople, it is for all the world like a gateway to Eastern Europe. For a day of shopping or dining, with perhaps a museum or the famed White Tower in the mix, you won’t be disappointed. There is a very young and urbane population and this translates into a night life scene that is international and sophisticated. 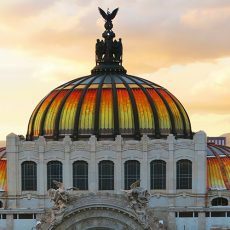 Prepare to be enraptured by this wonderful city. History – Please don’t Yawn! I am a history buff or ‘brick sniffer’ as I have rather unkindly been named. I love ruins and relics, museums are my cathedrals and dusty old books, filled with facts and often misinformation, are a joy to me. Of course, Greece is the Mecca (excuse the mixed metaphors!) for any student or enthusiast of antiquities. To discover that Aristotle, the father of Western philosophy was born in Stagira, an ancient ruin about 5 miles from its modern day counterpart in the heart of Halkidiki, was a wonderful surprise. If you travel to Olympiada, a small town in the North-eastern part of the peninsula of Halkidiki you will be very near to these living ruins. The site is in the early stages of excavation (about 16 years) by archaeological standards but contains enough structure and information to make it worth a visit. The area isn’t commercialised so take water and comfortable shoes to make the trek around the site. Among the ruins are two shrines to Demeter. She is the Greek goddess of the harvest and also the goddess associated with mother/daughter relationships. She and her daughter Persephone formed the closest of bonds and endured many trials the most famous of which saw Demeter rescue her daughter from the Underworld. If you are a mother of a moody teenage girl, it might be a pilgrimage of good fortune to visit this site and ask for divine intervention to help you bring your own beautiful offspring back from the Underworld of social media and general huffiness! If nothing else, the view from the top of the site out over the sea is glorious. If you are exploring this side of the peninsula, I really recommend ancient Stagira as one of the interesting places to visit in Halkidiki. Halkidiki’s three peninsula fingers all offer a different experience. Sithonia is considered by many to be the most picturesque. I certainly won’t argue with this assumption. Numerous beaches are dotted along its coastline. I especially loved Vourvourou – not least because it is fun to pronounce! It is the ultimate get-away beach, no jangling bar culture or nightlife to destroy the bliss of pottering along the beach at any hour. Immediately off the coast from Vourvourou lie nine little islands that can be reached by sea kayak. If you are keen on physical activity and adventure, it is a wonderful idea to pack up a picnic and find some quiet, deserted cove where you can swim and snack before paddling further along the coast. Searide provides an excellent kayak rental. If some of your party are too little for the kayak adventure, there are bigger boats that can be hired to get you exploring the Sithonia coastline. For the landlubbers who are keen on solid ground beneath their feet, the hills and forested paths around the Sithonia peninsula offer many levels of trail adventures. Always factor the temperature into your day of planning, as the intensity of the sun is a determining factor in how far you might reasonably be expected to travel on a day out. The locals at the bike hire companies will always give you the best advice on where to go and what to see. Sometimes it is best to lower the bar on how much you intend to do – give yourself time to take a swim or a refreshing doze in a shaded area. It’s not the Olympics – don’t push yourself and your party too hard! Guided bike tours run by Carduus Bike out of Lerissos, a town at the gateway to the Mount Athos peninsula offer experienced riders a day off the beaten track. Stunning views, quiet beaches, unspoiled forest trails – all of these await you and your group. Mount Athos – Men Only! Halkidiki tourist information has a great deal of information about Mount Athos. Not only does it refer to the actual mountain that reaches up above the peninsula but it also gives its name to the northern most peninsula of Halkidiki. It is also next to Ouranoupoli, which is the location of the Eagles Palace Resort. This remarkable peninsula is in effect a large living religious site comprising 20 vast monasteries. These buildings offer a place of contemplation and solitude for the numerous Christian orthodox monks who live and pray within their walls. The area has been deemed a monastic republic and the peninsula can control the movement of individuals and goods in and out of its jurisdiction. The history of the foundation of this religious site tells us that the Virgin Mary while travelling by boat to Cyprus had to stop on Mount Athos to shelter from a storm. She was so taken with the beauty of the region that she prayed to her Son to allow it to become a garden dedicated to her alone. The consequence of this tale is that the peninsula established early Christian monasteries on this site that flourish to this day. The rather ironic and disappointing part of the story, is that the Virgin Mary who is seen as the most important female icon to Christians has an entire peninsula dedicated as a Garden to her Glory yet no women are allowed visit the site. Are we women such a temptation to the ruminating monks that they might cast off their cassocks and pull on some Adidas sports gear and embrace the life of the flesh? I wonder. So, if you are a lucky man (and over 18 years of age) you can make an application to visit Mount Athos and get a glimpse into what a world looks like without female influence. Beware, you might choose to stay! I recommend that you get advice on how to get a permit to visit the Mount Athos region. For us womenfolk, we can hop on a boat cruise that sails around the peninsula allowing us to view the monasteries from the sea. They are quite extraordinary structures that cling to the edges of the cliffs. Tantalising near and yet utterly out of reach. 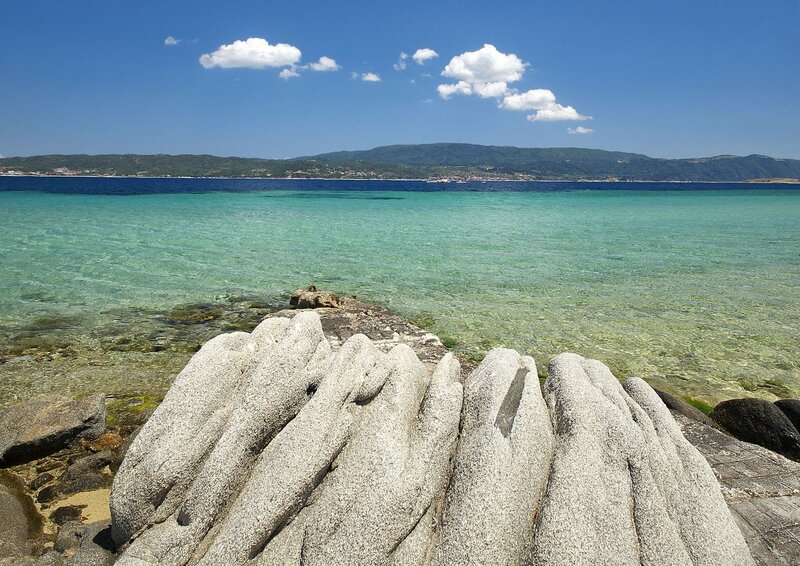 The administrative capital of Halkidiki is Polygyros a town and municipality at the centre of the region. It has a population of about 6,000 inhabitants. A nice place to go for a ramble and pick up some nice mementos of your trip. The blue eye decorative glass creations used in pieces of traditional jewellery are believed to ward off any evil influences. I thought my newly purchased necklace might have been the antidote to a rather late night of wine and dancing …. I chose to believe it really did offer the salve to my tired senses! This is a gorgeous little harbour village. It is the location for two regattas that take place in July and end of September. The Diaporos Regatta allow amateur but keen sailors to participate in a hotly contested race along the coast. The winner is celebrated in a prize giving ceremony at the end of the regatta weekend. Sailors arrive from all over the Mediterranean to join in this fun event. The whole village bristles with life during these fiestas. A lot of fun is to be had, even from a dry perch on land, at what is one of the best Halkidiki attractions. 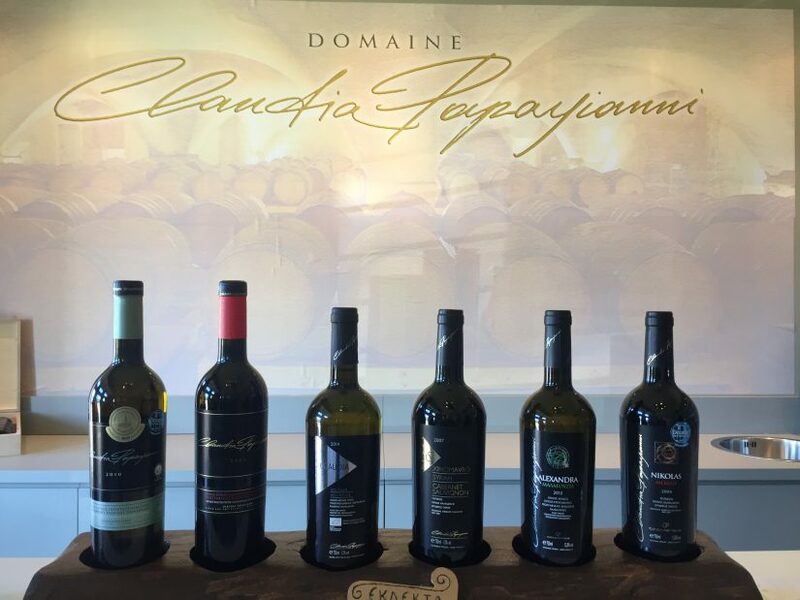 Not perhaps famed as a fine wine producing country, Greece has been busily at work re-engineering their vineyards and using grapes from around the world to expand and improve its wine offering. The largest collection of vineyards in Greece sit next to the village of Neos Marmaras. 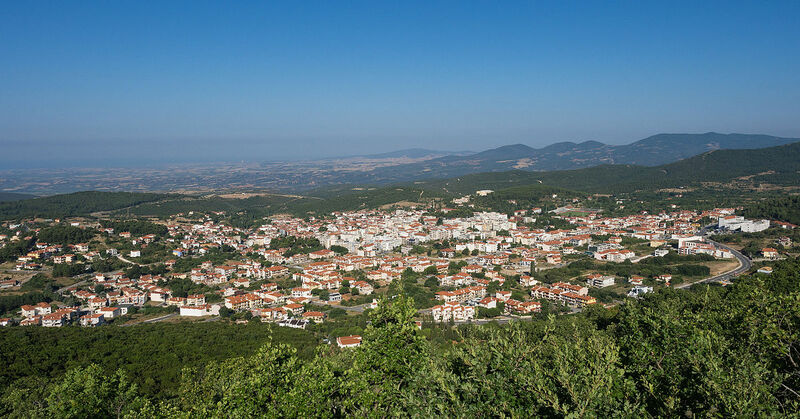 Porto Carras is a network of sloping sunny hills that are carpeted with mature vines. There are fabulous bike trails that allow enthusiasts to self-guide along gravel paths, up over Melitonas (a 1200 ft mountain) with spectacular views and wind round through another trail and come back to your starting point. Along the way, you will pass by numerous quiet sandy coves where a refreshing swim and picnic might just elevate your day into the realms of greatness. The traditional of wellness dates back to ancient Greece and to Hippocrates, sometimes known as the ‘Father of Medicine’. His famous quote “Let Medicine be thy Food and Food be thy Medicine” is a statement that we could all embrace more often in our dietary choices. From a cosmetic point of view, the great tradition of natural ingredients being harnessed for rejuvenation purposes has been elevated to world acclaim by Korres the wonderful Greek pharma-cosmetic brand. The wonderful organic and environmentally friendly products can be purchased from any good quality pharmacy in Halkidiki. The hair treatments are particularly famous and can revive even the most beach-trashed hair. 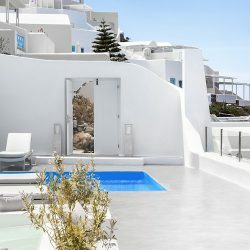 If you want to embrace the whole wellness experience in an unspoiled setting, it only seems fitting that while on Greek soil that you take yourself off for a day of restoration to the wonderful thermal spa overlooking the Aegean. If you haven’t ever visited a thermal spa the first noticeable element is the aroma. A pungent bouquet of salts and minerals burst out of a fissure in the deep earth. The naturally warm waters channelled into large pools and individual bath tubs offer guests a glorious opportunity to refresh all the senses. The natural heat of the water deeply relaxes all of those knotted muscles, the minerals are absorbed through your newly softened skin and balance is restored in your physiological being. The Agia Paraskevi, Thermal Spa offers wonderful treatments like the traditional Eastern Hamaam and physiotherapy massage or simply just bathe in the warm waters and relax by the pools. The waters are believed to assist greatly in the management of skin conditions, joint ailments like rheumatoid arthritis and just general weary and worn limbs. As one of the unusual things to do in Halkidiki, I think it’s a real winner. A day pass will allow you to use the facilities and lounge by the pool overlooking the Aegean below. With a snack bar and a gym, it can be a nice relaxing afternoon after a hike in the area. To say I was more than surprised by my visit to Halkidiki is an understatement. First of all, I don’t know how Thessaloniki has somehow escaped my notice. What a city. Culturally it is so different from other European cities and is teeming with young and fashionable inhabitants. Driving further into the peninsula and getting into the real heart of Halkidiki, I was impressed again and again by the natural beauty of the countryside and the warm welcome of the inhabitants. I was really entranced by the Sithonia peninsula. I loved the freedom and space out on the calm waters. It felt safe and sheltered. Obviously, I was utterly disappointed to discover that I couldn’t visit Mount Athos and as we hadn’t booked ahead the men in the group couldn’t make the ‘pilgrimage’ either. That, is for another lifetime, I am thinking. On one of our outings, we were told by a local man that some of the ancient gold mines of Halkidiki have been reopened and that a mining company is once again digging deep into the ancient soil to source this precious commodity. On a quiet candlelit evening, with the crickets whispering around my villa terrace, a glass of lovely local wine in hand, I gazed across the darkening sea. The sun was setting in a blaze of oranges and yellows. I thought to myself “no mining is required”. The gold of this remarkable corner of Europe is in the mysteries of the land, it is found in the heart of its people and in the space between time or Kairos as the ancients called it …. and it is priceless. 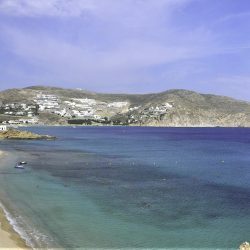 If you’re interested in Greece then you might enjoy my article on things to do in Mykonos.